Tomorrow is December 1st - time to crank it into full gear! 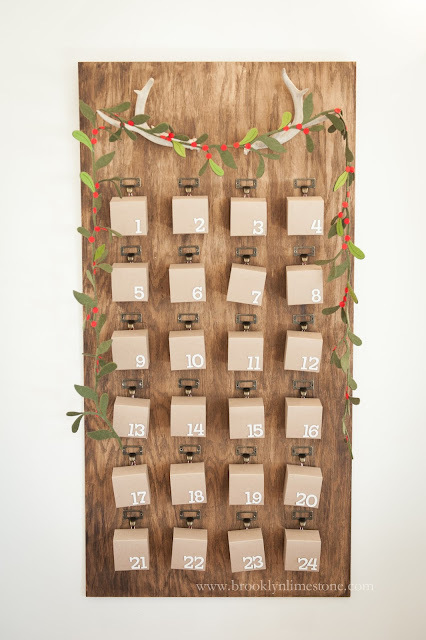 Now that Aggie can really enjoy it, I decided to finally erect an advent calendar this year. I'll be honest - I was of two minds about the concept. On the one hand, I love going a little bit overboard and adding those little moments of joy to the season wherever I can. On the other hand, was I creating a present monster that only is happy when receiving? But you can tell which side won out. I'm sure I'll have plenty of opportunities to make her a more well rounded selfless person but I can worry about that another day. Once I decided to do it, I knew I wanted something that would add to the decor as well as be easily stored. I took my inspiration from vintage hotel key racks and went to work. I have a thing with antlers and mountain lodges this year so the antlers were the perfect way to top it all off. This project was a little bit of a chore as pre drilling and then screwing in so many tiny pieces of hardware took quite a while but now it's done, I'm so pleased with it. I think it would make a pretty cool party favor or seating card display rack too so hopefully I can get some other uses out of it as well. While it was time consuming, it's fairly easy to recreate. I used 1/4 sheet of plywood, wood stain, a set of antlers purchased on eBay, card catalog hardware, Loctite crazy glue, kraft boxes, small cup hooks and bakers twine. What is your take on the advent calendar craze? Worth the effort or am I getting myself into trouble? I wouldn't worry about Present Monster, but to get around that, every third box or so you might have a wee wrapped present for her to give to Daddy or Kitty ( have you gone there again?) or Grandma, etc. Coming up with ideas for the treat was always my problem. We had really simple ones as kids (you know the little paper ones with the chocolate inside you buy at the supermarket) so I had definitely known them...but definitely not the crazy versions that are more common now. So add me to the crazy pile. No, no kitties for us for a while. We are still mourning Big Cat. I figure in a few years when she is really dying for a pet, we will get another kitten but we kitty less for the near future. Oh and I forgot to mention that I am shamelessly using candy/chocolate in 50% of the boxes. It was hard enough finding 12 small non food gifts that I'll let her rot her teeth for the other 12 days. I started with a weeks worth of envelopes taped to the kiddos door in the shape of a tree.. It's grown into an old 24 slot soda crate with a small mailbox for the 25th day. We both get such a kick out of it and this year special requests were made from years past favorites. Priceless memories for both of us :) and so much fun to create!!! This is awesome! I love it and to help with present monster maybe some of the boxes could say "hot cocoa date with daddy" or "walk in the park with mommy". Getting out and active and when older volunteering. Love it! Fantastic!!! I did the Advent Calendar with my 3 kids (all grown up now) so I had to fit 3 little goodies in there. Mine is shaped like a big gingerbread house and they took turns opening the door for that day. I made a special trip to Josh Early Candies for small foil wrapped candies, peppermints etc. I also stacked 3 quarters or 3 dimes, a note giving hints where something was hidden (shiny Santa pencil, little wind up toys, and other small goodies). Not to worry about present monster, she'll be grown up before you know it and off to college. These are moments you will treasure forever. I'd give anything to wind back the clock and watch their faces when they opened that little door and feel their Christmas excitement. 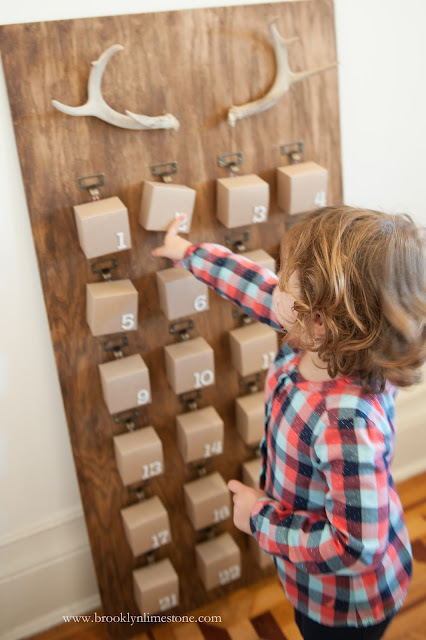 Savor every second, one day she'll ask mom for that Advent Calendar she had as a child for her own kids and your joy will be complete. How about filling each box with a different tiny ornament she can add to either your family tree or "her own" little tree? Great job you did in both designing it AND executing the design. Enjoy this time-because as I have commented here a few times before- before. you know it she will be 24 and she'll decide she wants to live in the Big Apple! For you, that's not such a stretch, but for me, well, we're in South Florida, so NYC IS on the other side of the earth, almost. Even by your extraordinary standard of fabulousness this is fantastic! Could you post a step by step 'how to' or is that too much at this time of year? Adorable! 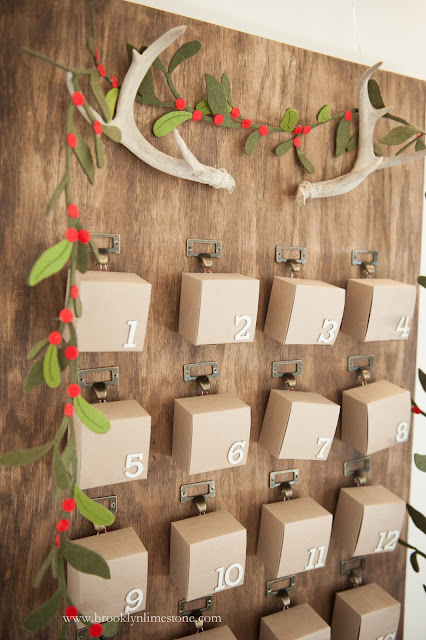 Oh - and the advent calendar is cute, too ��. Nothing says the contents have to be edible or 'gifty'. One year I made 24 little red stockings for my grandchildren. 4 of them all siblings. The stockings contained small candy canes, cards to color and give to a friend, little chores to do to get the house ready for Christmas, a pouch of popcorn to make for a family movie, straw to add to their nativity. Anything I could think of times 4. My daughter and I kept this up til they were grown. The last 2 are in high school and still look forward to it. You are making memories that will last your family for a lifetime.